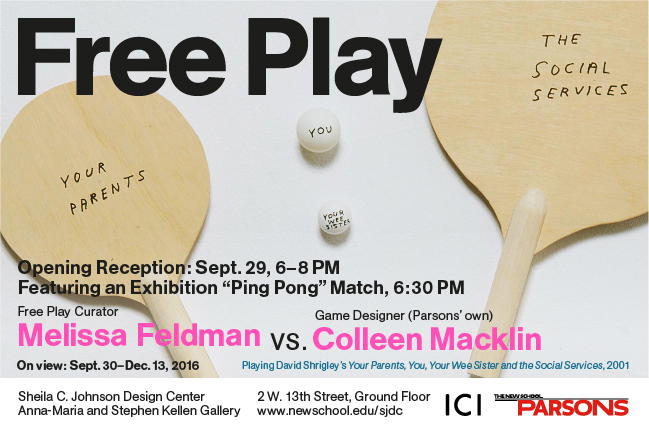 Stop by our new exhibition, Free Play, which opens this Thursday, Sept 29 at 6 p.m. in the Anna-Maria and Stephen Kellen Gallery. Strategies tied to game playing have historically attracted the avant-garde, most famously the chess master Marcel Duchamp. Free Play explores the significance of games, reinventing them to create experiences that involve the viewer and reflect on the nature of participation in art and art exhibitions, as well as strategies of decision-making around contemporary culture and politics through play. Among the arcade of objects in the show is a version of Guitar Hero by Cory Arcangel, hopscotch by Mary Flanagan, and Ryan Gander’s double blackjack – while the more mystically inclined may gravitate toward Allan McCollum and Matt Mullican’s divining game. Other artists include Patrick Bernier and Olive Martin, Ruth Catlow, Futurefarmers, Jeanne van Heeswijk and Rolf Engelen, Paul Noble, Pedro Reyes, Jason Rohrer, David Shrigley, Erik Svedäng, and Yoko Ono. You’re invited to come in and play! Free Play is curated by Melissa E. Feldman and organized and produced by Independent Curators International (ICI), New York. Free Play was made possible, in part, by grants from the Elizabeth Firestone Graham Foundation and the Robert Sterling Clark Foundation, and with the generous support from ICI’s International Forum and Board of Trustees.